Over 30 published studies performed at the Virginia Medical School have shown that ChirositolTM, a nutrient derived from carob, is an effective supplement promoting healthy glucose metabolism including weight gain, as well as for excess androgen (male hormone)-related concerns such as PCOS, acne and male facial hair growth in women. There is a connection between the loss of our waist and changing hormones. The main hormone involved in blood sugar balancing is insulin. When you eat food sugar increases in the blood and insulin is secreted to 'push' sugar into your cells where it is burned up like a furnace. When you have gained weight or if you eat a high carbohydrate diet sugar builds up in your blood stream leading to weight gain, high cholesterol, high triglycerides, elevated blood sugar and especially belly fat. An early sign of elevated blood sugar is skin tags. Research shows 4 skin tags or more and you should have your blood sugar checked. 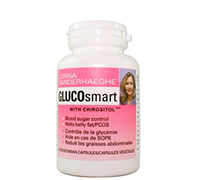 ChirositolTM has been shown to promote healthy glucose metabolism and blood sugar levels. ChirositolTM works by pushing sugar into the cells thereby controlling blood glucose levels, glucose storage and the action of glucose in the cell. It will not, however, cause low blood sugar in those with normal blood sugar levels. ChirositolTM also elevates our happy hormone, serotonin. Reduced serotonin or poor metabolism of serotonin is linked to increased sugar cravings. By balancing serotonin and blood sugar, ChirositolTM also helps to control appetite. Polycystic ovary syndrome (PCOS) is an insulin-resistant disorder with resulting elevated male hormones. Many fluid-filled cysts may be present in the ovaries, but some women may not have cysts in the ovaries making it difficult for doctors to diagnose PCOS. In this disorder, fasting blood sugar and insulin will be elevated which can cause luteinizing hormone to increase the production of male hormones that can cause acne and coarse facial hair growth in women. Oily skin may also be evident. Affecting up to 10 percent of the population, PCOS is the most common hormone dysfunction among women in their reproductive years. Symptoms often become apparent in puberty, when menstruation begins. Irregular menstrual periods with excess bleeding may occur, or PCOS can cause a lack of periods altogether. Because eggs are frequently not released, infertility is a major concern of women with PCOS. If pregnancy does occur, it often ends with first trimester miscarriage or is associated with gestational diabetes. If left untreated, PCOS can lead to cancer of the uterine lining. Women with PCOS also are at increased risk for blood sugar abnormalities, cardiovascular disease and hypertension. PCOS is a very challenging condition to treat and ChirositolTM effectively reduces excess male hormones, reduces weight and appetite, and normalizes ovulation, thereby improving fertility. ChirositolTM also restores normal ovarian function. Helps to reduce serum testosterone in women with PCOS. ChirositolTM also controls hyper-androgenism, hirsutism and menstrual dysfunction by helping reduce serum testosterone and thereby promoting normal ovulation. ChirositolTM reduces oxidative damage to follicular fluid proteins. It helps women with PCOS restore the number of high quality eggs or ovum and helps restore the number of high quality eggs or ovum in women with PCOS. It also helps the body metabolize carbohydrates and fats. If you have been battling PCOS, ChirositolTM is the solution. This product does not contain artificial colours or sweeteners, dairy, soy, shellfish, corn, wheat or yeast.